Lamiacucina: Candied, chocolate coated Garlic. Garlic cloves were heated in a strong sugar-coffee solution. Cloves were then dried and coated with chocolate. 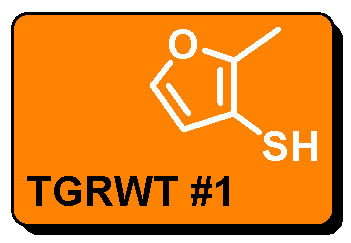 Succession of taste and aroma: strong, unpleasant character of garlic. Bloggers verdict: disappointing! 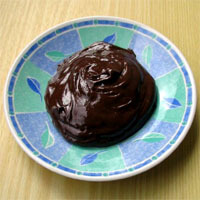 Blog & White: Chocolate-Coffee Mayonnaise with Garlic. 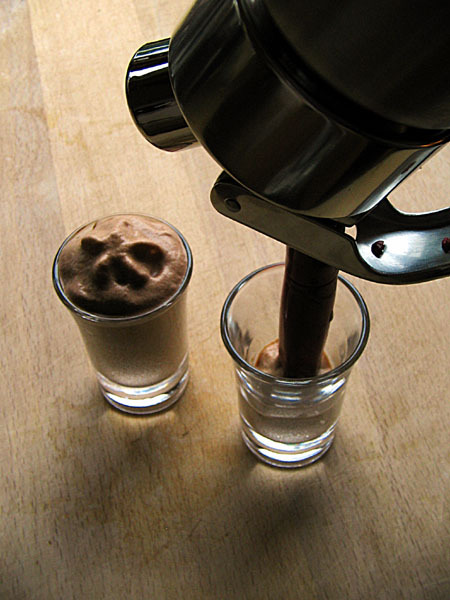 Adapted from Hervé This’ chocolate mayonnaise with added coffee and garlic. 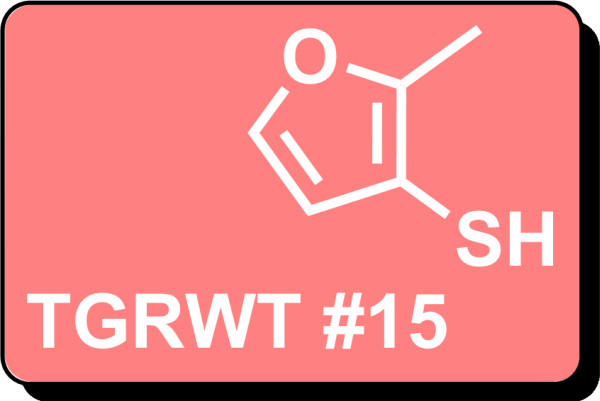 Succession of taste and aroma: chocolate aroma is followed by taste of garlic and sweetness of chocolate, coffee aftertaste. Bloggers verdict: Interesting (but wife hates it!). 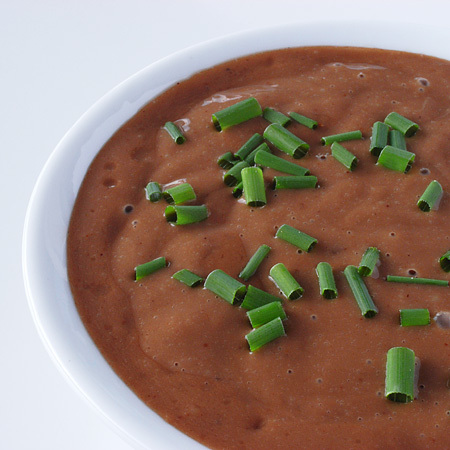 Should you eat that: Mocha Tofu Mousse with Garlic. 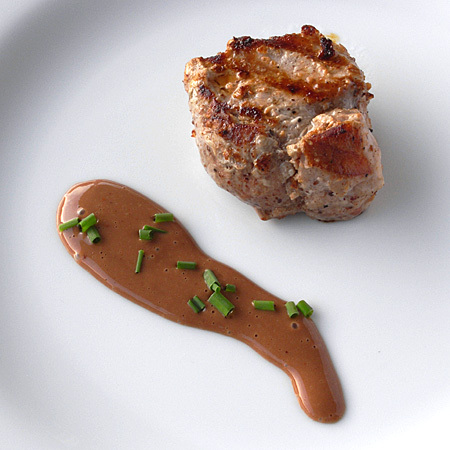 Roasted garlic cloves were added to an adapted version of Scharfenberger’s mocha tofu mousse. 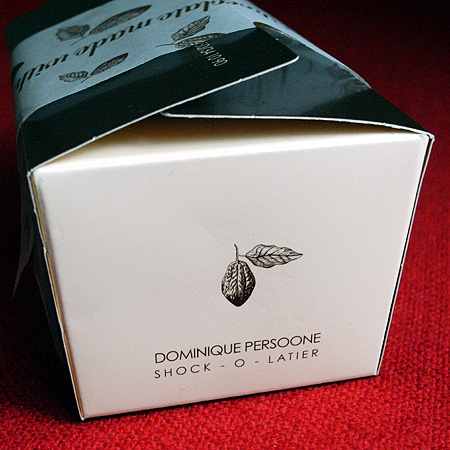 Succession of taste and aroma: coffee followed by chocolate, then a subtle, sweet, roasted garlic aftertaste. Bloggers verdict: I would definately make it again! 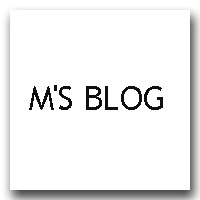 M’s blog: Mocca garlic creme brulee. 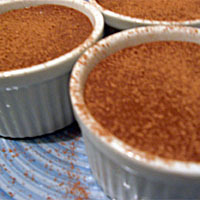 As the name suggests a creme brulee with espresso, chocolate and a garlic clove. Bloggers verdict: Tasted like mocca creme brulee. 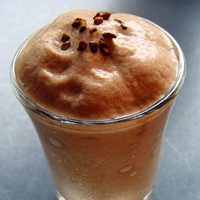 Khymos: Coffee espuma with garlic and chocolate. 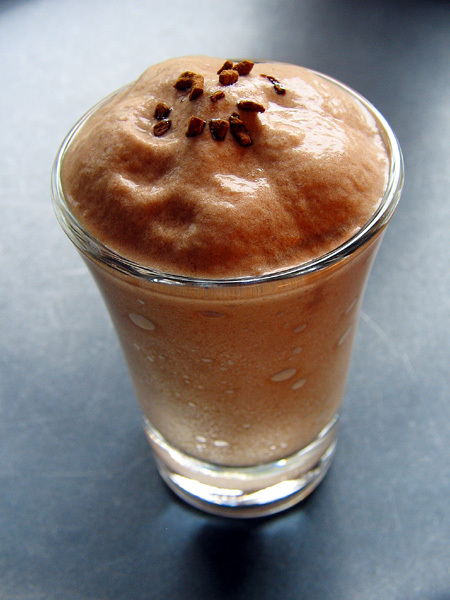 Coffee and cream espuma with added chocolate and roasted garlic. 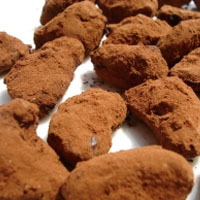 Succession of taste and aroma: coffee with sweet taste, then a faint chocolate aroma followed by a garlicky aftertaste. My verdict: Aromas blend well together. Would use less garlic for dessert version. GrapeThinking: Roasted garlic dipped in melted chocolate with coffee beans. Succession of taste and aroma: Roast garlic doesn’t have much of a smell. Chocolate and coffee always smell good. Bloggers verdict: Good aroma. Taste was good in the beginning; slightly funky aftertaste. Texture of garlic was good. 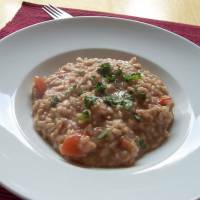 Kompottsurfer: Espresso-risotto with bitter chocolate, tomatoe and mozzarella (posting in German). Bloggers verdict: Color was a disaster, and difficult to get relative proportions right. But aroma worked out prette nice. From the different comments it seems that garlic is a difficult beast to tame, especially when used raw. 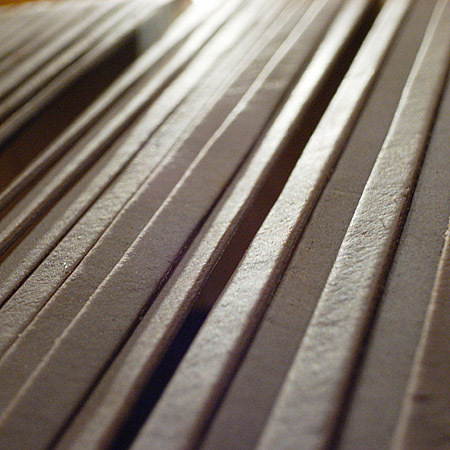 A major challenge is finding the right balance between the aromas. Garlic was either too strong or almost absent. 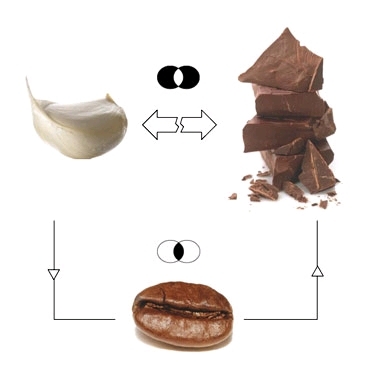 Chocolate and coffee however seem to go very well together (and my preliminary search for odor activity values confirm this – more on this soon!). Is it a coincidence that coffee is the first aroma noticed in the two “foamy” preparations or is this simply a result of the different ratios used? Brown onions. Add the rest and simmer. Season to taste with chocolate, balsamico vinegar and sugar. Serve with rice. Sprinkle with coriander/cilantro or ruccola/rocket salad. There were also a number of recipe suggestions in the comments to the three posts on the coffee/chocolate/garlic theme. 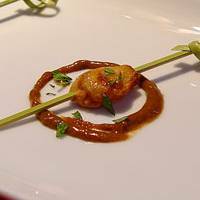 …you can also use foodpairing to pair food that doesn’t match. Like chocolate and garlic. 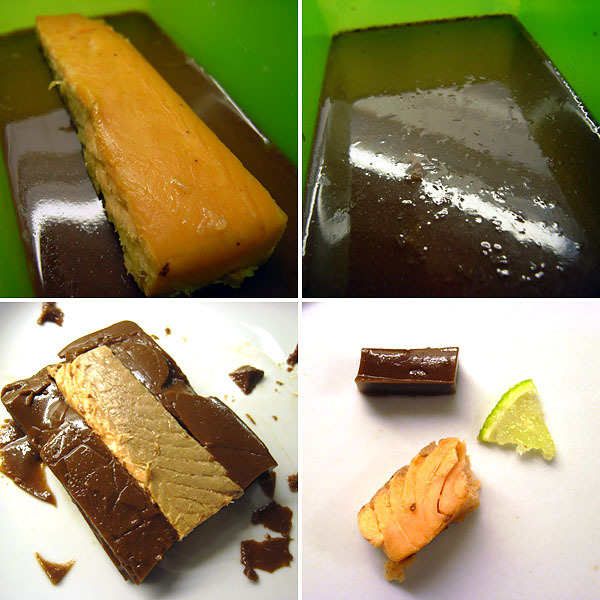 The trick then is to search for a third food product that has something in common with chocolate and with garlic. An example is coffee. Coffee has flavour components in common with garlic: Dimethyl disulfide and with chocolate: Methyl pyrazine. My challenge to you all is to come up with recipes that include garlic, chocolate and coffee. Any suggestions?